This may be a set of all "good guys" - depending on what your definition of "good" is. Captain Jonathan Barnet, commander of the British Navy's Man-O-War Albion, is a very formidable seaman and pirate hunter. Coming from a very well to do faimly, Captain Barnet holds tradition and the Crown in very high regard. He finds his time with Jack to be very distasteful. Hello, Admiral Norrington. Actually, this is one of the characters who seem to remain fairly true to real-world history. Jonathan Barnet really was a pirate hunter and captain of the Albion. He was hired specifically to apprehend Calico Jack, and he was successful. Apparently in the alternate timeline where these toys live, they started working together, rather than what actually happened. Barnet has a young face, but gray hair - probably a powdered wig, unless he's an ancestor of Steve Martin. There's a... thing on his forehead that I initially mistook for a lock of hair, but actually seems to be a round jewel on the brim of his big blue hat. He's got prominent cheekbones, but not a lot of wrinkles, which is why we call him young. 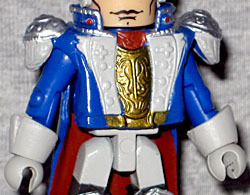 He's wearing a fancy naval uniform - bright blue jacket with silver trim and a red lining, pale gray lapels, a golden shirt or armor or something, gray gloves and pants, and tall black boots with silver greaves. The "gray" parts are probably all meant to be white, but he's been at sea for a while with no access to bleach. A lot of the details are sculpted, much to Rustin's chagrin, but it really looks nice - the details just wouldn't work the same if they were painted. And heck, if you don't like it, you can take the coat off to reveal a painted jacket beneath. It seems that Barnet is a southpaw, if his sword is any indication. Unlike the blades wielded by Calico Jack and Charles Vanes, this sword actually looks like something a real person would carry (or forge); it's just designed to be held in the left hand, judging by the shape of the hand basket. He's also got a fancy silver pistol, but you can use one of those with your off-hand, no problem! Nukpana is one of Captain Jonathan Barnet's crew. The struggle against the pirate plague has been a long and deadly affair and one that at times requires a special skill set. Nakpana came to Britain via the new Colonies. Remember, this story takes place in the 1720s, so yes, the "Colonies" would still be somewhat new then. 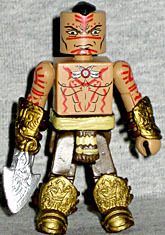 Nukpana appears to be the only character in Series 1 who was created whole cloth - or at least the only one who doesn't have a direct recorded inspiration. It's not unthinkable that an indian would have found his way onto a ship's crew, but there's no specific record of this guy. We can assume he's Hopi, though: "Nukpana" means "evil" in Hopi. Only problem with that? Arizona was never one of the "colonies" - at least, not from England's point of view. Nupkana has a very angry look on his face, but it's a restrained anger. He's frowning and his brows are furrowed, but he's not shouting or showing his teeth. Uniquely, he's painted with his eyes cast downward - as far as we can remember, no Minimate's ever done that before. It gives the impression of him looking down in contempt at some fallen foe. 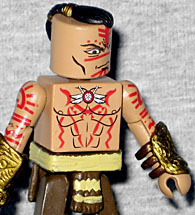 The figure is stripped to the waist, and has red paint (or tattoos?) on his chest, arms and face. He has a new ponytail hair piece, and the rest of his head seems to be shaved bald. He has a nifty loincloth that's wider in the front than in the back, and brown pants - if they had stitches down the sides, we'd call them buckskins. His feet are fancy new pieces with heavy armor on the fronts and straps around the back. He's got a large bracer on his left arm, but not his right. Why not the right? Because he doesn't have a right hand. Instead, he's got a large, etched blade weapon that straps onto his stump. And for the times when he needs some ranged attacks rather than just melee, there's an alternate hand that has a three-barreled gun. The set of Jonathan Barnet and Nukpana is a good one. The designs are nice, with just the right amount of sculpted elements to look detailed without looking busy. 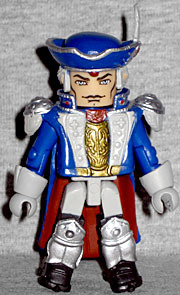 And honestly, the pairing of a man in a fancy hat and an indian makes this feel a little bit like an unofficial Brotherhood of the Wolf Minimate set.